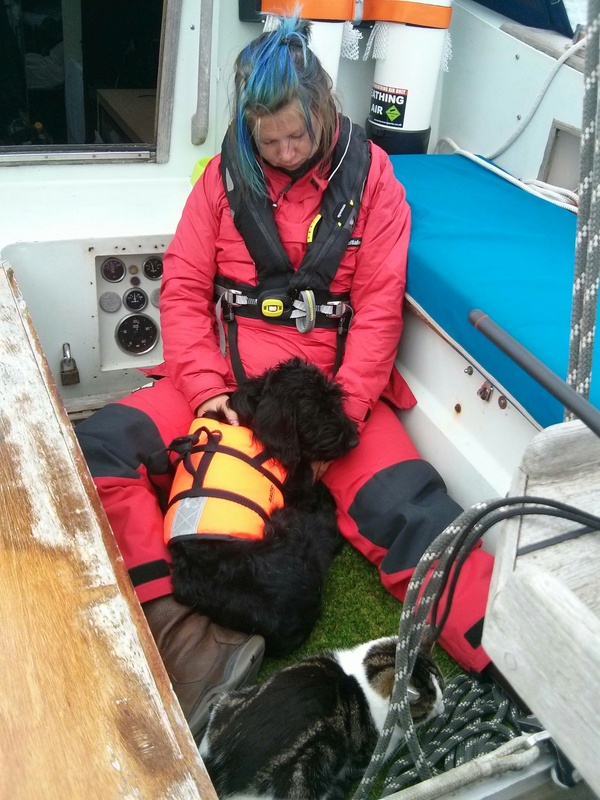 A week or two before departure, we realised that a) Bella hadn’t experienced sailing b) Walter was still traumatised from Dieppe and c) we had had quite a few things done since our last sail a few weeks previous. So we invited our friend Sean along, and conned another friend Joe (who had really only visited the previous day for beers and a catch up, but got a bit more than he’d bargained for!) into joining us! There wasn’t much wind, but plenty to at least get the sails up and sail (and it was sunny, which always helps), check the pets didn’t freak out (or us for that matter), try out our new toys, and test the things we’d spent the last few weeks fixing. All went well, so we were ready! Gosh! Our pontoon neighbours, Jamie and Penny, came out to help slip our lines, and we headed for the fuel pontoon, where we saw another neighbour Mark (who works for the marina and was on refuelling duty). Kevin also came down to see us off, as he had missed joining Pip and us when we went for ‘last night beers’ the previous evening due to the Deck Replacement Programme they have been undertaking in the shed! Pip and Kevin have been round the world themselves, and have been a great source of information – as well as becoming good friends – over the last year. That said, we did still enjoy making Kevin envious by going over our plans again as we re-fuelled! It was him that slipped our final line in Brighton, and out we went into the Channel for the start of our big adventure! The sea was fairly lumpy and we were both seasick (having made the schoolboy error of forgetting to take the tablets…). Jamie claimed first blood on this, but I was not far behind, and it was ginger biscuits and water all the way from there! I also did my normal trick of falling asleep at any given moment. 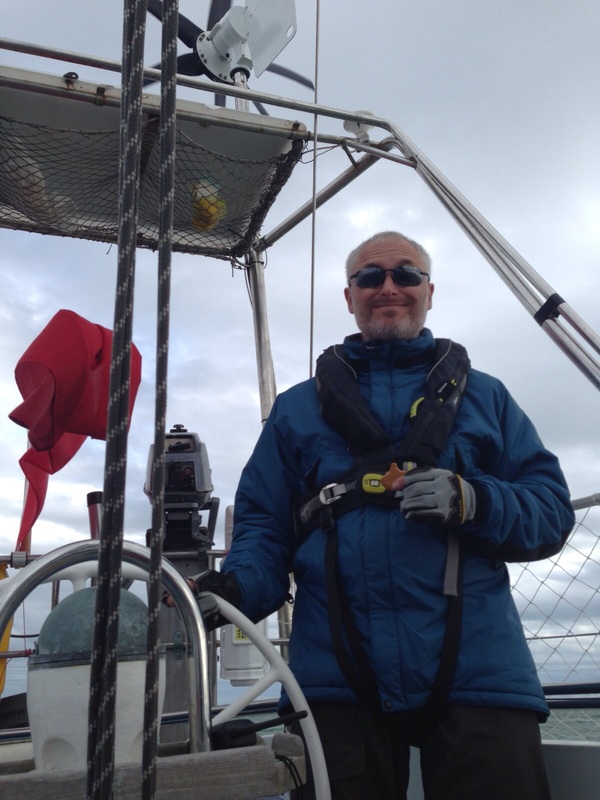 The helmsman sticks to ginger biscuits…. We arrived into the Solent under power in the end, but it did make it a lot easier to negotiate the shipping lanes and buoyage (for these novices at any rate). That said, it was really enjoyable to navigate in such a busy area using just a paper chart (Yes! A paper chart!) and our eyes! In the middle of all this, we got a call on Channel 16 (an emergency frequency that all craft should constantly monitor)! Umm… Was there a big ship bearing down on us? Had we wandered into a Submarine Exercise Area? Luckily, it was from friends on Tehari 2, Bob and Angela, who were going to meet us at Gosport, so we changed to Channel 77 to coordinate! I like using the radio and – as most of you know – will chat to anyone, so it was all quite exciting to get our first radio call! Enjoying the radio so much, we then radioed Gosport marina – part of the Premier Group (same as Brighton) so we could use our ‘free’ nights – and got allocated a berth which was, luckily, nice and easy to get into! I went up to the office, and met Bob and Angela there so we all went back to the boat for a cold beer to celebrate our arrival! We must also confess at this point that it had been our longest single passage!! And yes, we do still plan to cross a) the Bay of Biscay, and b) the Atlantic and Pacific at some point! More drinks ensued, followed by bed and a very deep sleep! We knew that the forecast was poor for the next few days, so we weren’t bothered about not being too productive. We were pleased that we had finally left, and felt like we could relax and catch up after a manic few weeks! Gosport is a bit of a forgotten little town, but we found it to be really nice, very friendly, and with some lovely pubs! We appreciated it even more after we took a day trip to Portsmouth and discovered that a) it’s a bit of a hole and b) it is disproportionately and outrageously expensive! Although it did seem to have the highest proportion of mobility scooters per head that we had ever seen! We ended up wasting a further day when we could have got away, but it had been so nice to have some relaxing time, that we couldn’t beat ourselves up too much about it, and left the following day for Weymouth, where we planned to anchor overnight in the bay. We got away ok, after the boat reminded us that she is long keel and will go in whatever direction she likes, especially in reverse. Ok, point taken, now back to the Solent! Again, it was fun navigating out on the chart, although there was precious little wind, and what there was was on our nose, so the motor stayed on. We could have sailed, tacking continuously, but we were also conscious of a bit of a time deadline and, we admit, a mentality of ‘let’s just get there’ had started to set in, which was not good, but – at this stage – we felt was important. Biscay was our limiter, both insurance-wise (should be crossed before the 1st October) and weather-wise (weather windows to cross increase in rarity as the year progresses). So off we motored. It took us 4 hours just to get out of the Solent, but things like the Southampton shipping lanes kept us occupied! As we emerged, we passed between the Needles (where just last year, Louise, Susanne and I had celebrated Susanne’s *cough cough* landmark birthday), and Hurst Castle near Lymington, with its picturesque castle. Wind still on our nose, but a lovely calm sea, we looked at the possibility of a through-the-night trip to Plymouth. 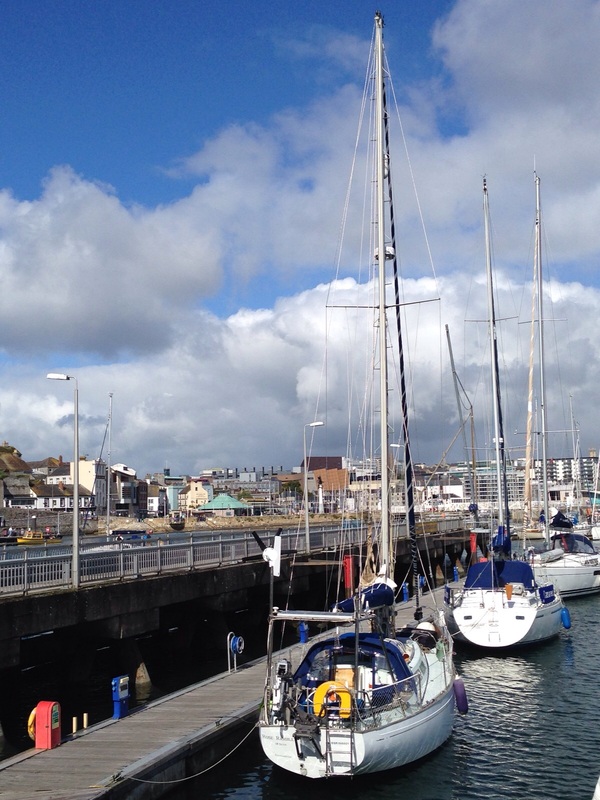 We had only planned to anchor at Weymouth for a sleep, so we got the charts out and re-plotted our route, which would get us to Plymouth around 8am – or so we thought! As the sun set and moon rose, we started our watch system. We decided on 3 hour watches – this is basically as long as we feel it safe to concentrate, yet also long enough to get a good couple of hours of reasonable recovery sleep. Jamie took the first watch, but as I came up for my turn, he asked me if I’d fitted some fancy neon under-lighting when he wasn’t there… I was a bit confused until I saw the amazing phosphorescence that was in our wake, and coming off our bow wave and all over the boat’s hull – an eerie green glow that both looked a bit spooky, and lit up the surrounding waters beautifully. Now that was good, but the dolphin pod were better! Only about half an hour after I started my watch, I saw what I thought were shadows of large fish – until they started jumping! There were three of them – juveniles by their size (in my professional opinion ha ha), but small at any rate. Once they started following us, I woke Jamie, and we spent a good 10-15 minutes just watching them jumping and playing around the boat. They were creating their own trails of phosphorescence, so it was easy to spot them! This is why we came sailing! And we’re not even in warm and sunny places yet! We were a bit concerned, as the engine was not charging the battery properly, so we were losing power – not in a big way, but we did start to turn things off – the fridge, any non-LED lights, even the chart plotter had to go (but the superb autohelm HAD to stay!). Something to look at at our next stop! My shift over, I retired to the off-watch bunk (i.e. the sofa with a duvet on it next to all the fenders). Jamie saw two more dolphins – larger adult ones this time, and also two shooting stars! I was quite envious when he told me as I’ve never seen one – they sound amazing judging by his description! 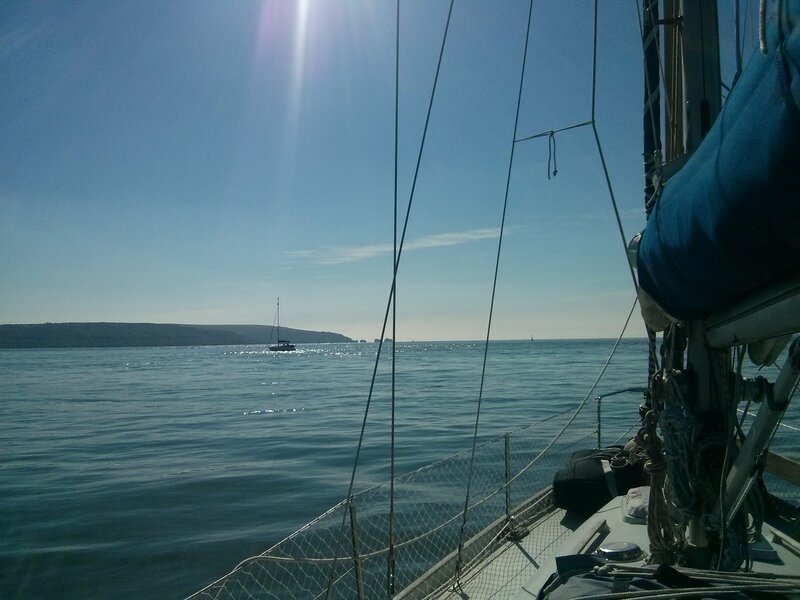 All was going well, the sun was up, we were nearing Plymouth, so we had essentially cut a day off our plan. 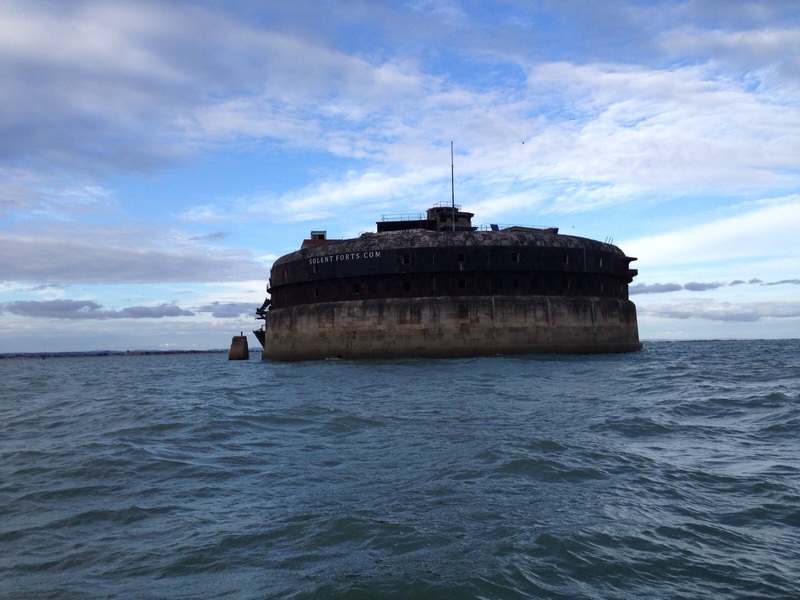 We started to round the Mewstone into the Plymouth estuary when…. We ran out of fuel. Bugger. We had motored all the way, and been making 6kts or so, and had somewhat overestimated our range (which we had based on our trip down from Hull, when I suspect we were going a bit slower, with lower revs)… No matter – too late to worry about that – we had run out of fuel (luckily we had 3 full Jerry cans on board), and that was that. We stuck a can in (about 25 litres), and tried to start the engine. I say ‘tried’ as that was all it was – a failed attempt. Not a cough was to be heard. So, to cut a long story short(ish), we cleaned the filters (after spending a little while looking for them, then a little longer emptying the lockers so we could access them), and we drained the air out of the system. I say ‘we’ but I really mean Jamie – I was like the surgeon’s assistant, passing him things and making sure Bella didn’t chew anything she shouldn’t. These sound like easy jobs, but in a boat (whose ‘canny’ storage we usually praise), it was an exercise in both contortion and physical exertion. Jamie didn’t even change from his sailing clothes – a stark difference from myself, as most of the mechanical maintenance I have done has been in my pants… Moving on from that image, we were lucky that it was a) daylight, b) pleasantly sunny and c) an area of low current at the time and not too close to the Mewstone headland or the shipping channel. After a couple of hours, the engine majestically sprang to life (luckily there remained enough life in the battery to start it…), and on we continued for the last 30 minutes (yes, so close and yet so far) to Queen Anne’s Battery Marina to celebrate our arrival in the usual fashion! 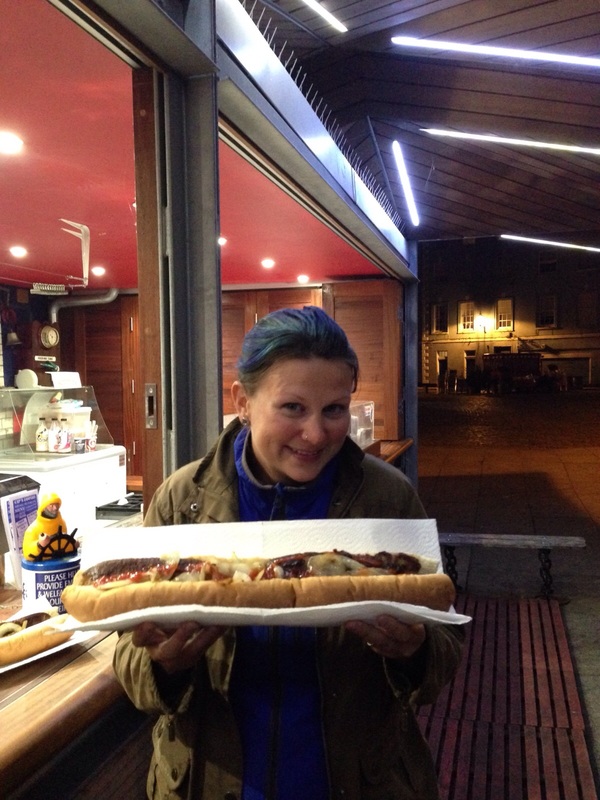 We arranged to meet our friend Phil for a few sociable drinks in town that evening, finished off by a Cap’n Japers’ half yard hot dog. Guess we won’t find many of those in Spain? We waited out a bit of what was forecast to be bad weather (but actually turned out to be ok), then finally set course for Falmouth on the 25th Sept. We left a bit later than planned due to a lot of faffing around, but the weather looked good, so off we set. There had been a lot of helicopter activity at the marine barracks during the morning, and as we got out of the estuary, we saw several large navy vessels ‘hanging around’. We checked the charts again for restrictions, found none, so proceeded to plough through the middle! 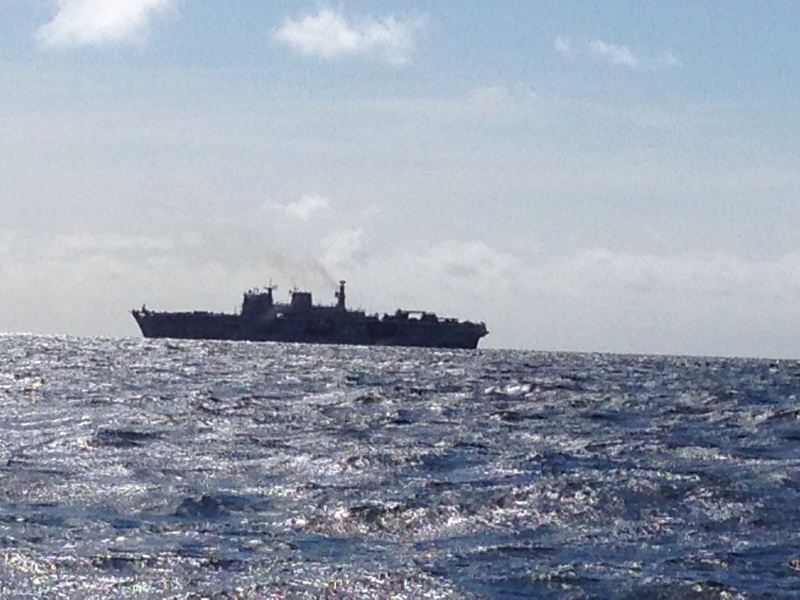 The wind was picking up, against the tide, and on our nose (again), so it was a lumpy, uncomfortable journey, but watching what was, we suspect, the vast majority of the UK’s serviceable war ships and helicopters buzzing around us kept our minds off the sea state. Remembering to take our sea sickness tablets for once also helped! Pretty big ship… Really quite close! 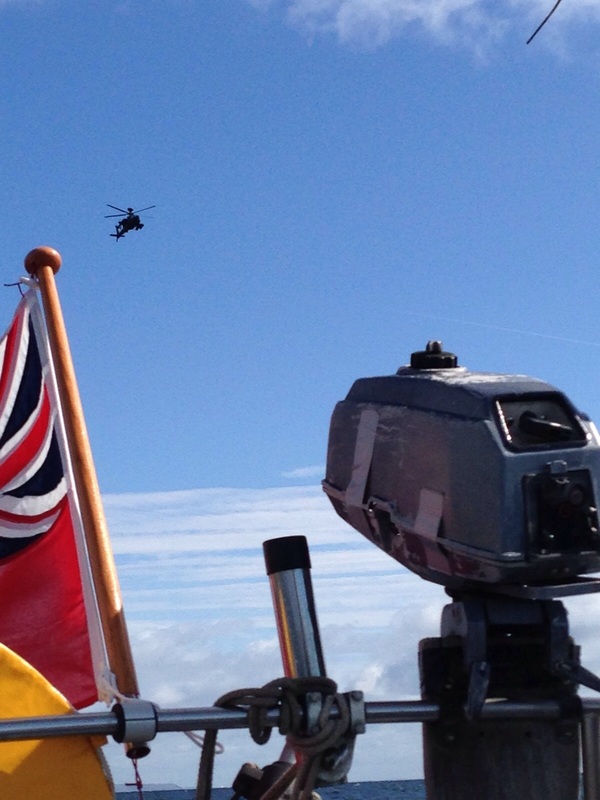 The Apache following us was slightly more worrying…. We were also concerned about the amount of water in the bilges that we were having to pump on the way. We had had the water tank out to do a few repairs before leaving Brighton, but it was worrying to think that we were losing so much with the Bay crossing imminent. We have 5 x 25 litre water Jerry cans, but it’s still not an ideal situation. 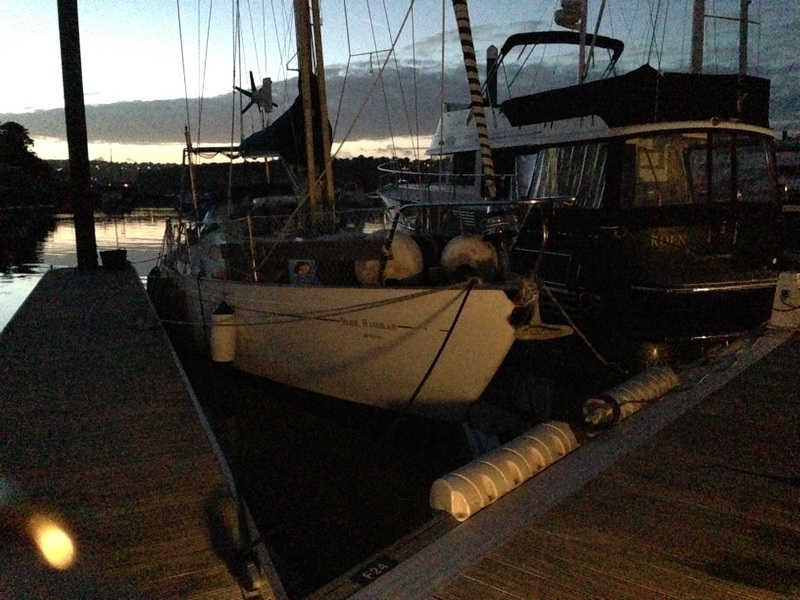 Due to our later-than-planned departure, we approached the Fal estuary at dusk. And low tide. All went well, and at least the batteries were charging as they should have been off the engine, so we had the right lights on and the chart open. All was going well, we radioed the marina to get our berth, then cut in to the dredged channel too late and promptly grounded. About 10m from our berth. Hmm. This ‘so close and yet…’ is getting beyond a joke. Luckily, we were pretty much dead on low tide, so we only needed to wait 40 minutes before we could get moving again. We slipped, like well-oiled slippy things, into one of the lovely new berths at Falmouth Marina (another Premier, so more free nights! ), and went more or less straight to bed! The following day was spent doing a few tasks like baking bread, cooking up some daal in the Mr D’s slow cooker as passage food, doing some laundry etc. We also dug out the Jerry cans since we thought we’d have to use them if our water tank was going to release that much on a short-ish passage that had merely been a bit ‘plungy’… Lucky we did this – for several reasons… We have a chain locker up at the front, with a pipe that takes any seawater that washes over us outside and back to the sea. Except that the jubilee clip holding it on had failed, and the pipe had fallen off…. So all the sea water we had plunged through was basically draining straight into the bilges… And there was a LOT of sea water! Still, at least we had found it out, and at least it wasn’t the water tank! We took a road that we thought would lead back to near the marina, but instead led us straight back into town. Although it did give us the chance to see the busker spending his earnings in McDonalds and Wetherspoons. We stopped at an incredibly cheap pub (a Guinness, Kronenburg, and a lime & soda for £6.40! ), then headed back, empty-handed of treats for our engine. We started to look at the weather for the Bay – it is roughly a 4-day crossing from Falmouth to La Coruña, so we wanted about a week that looked decent, and it looked like we had it. It’s a big crossing; geographically (over 400 nautical miles – remember we’re only averaging about 5 knots); but also physically/physiologically/mentally (at least 96 non-stop hours of 3 hour shifts, constant movement, as well as dealing with any issues that arise with the boat). We are not experienced sailors, I am not at full-fitness, and we have some pets to appease as well, so we wanted to make it as easy on ourselves as we could! However, it looked like we had our window, so we discussed it, checked, re-checked, and agreed: let’s go for it! We had aimed for a midday departure, but clearly this didn’t happen (I don’t think we’ve left anywhere at the time planned since Brighton! 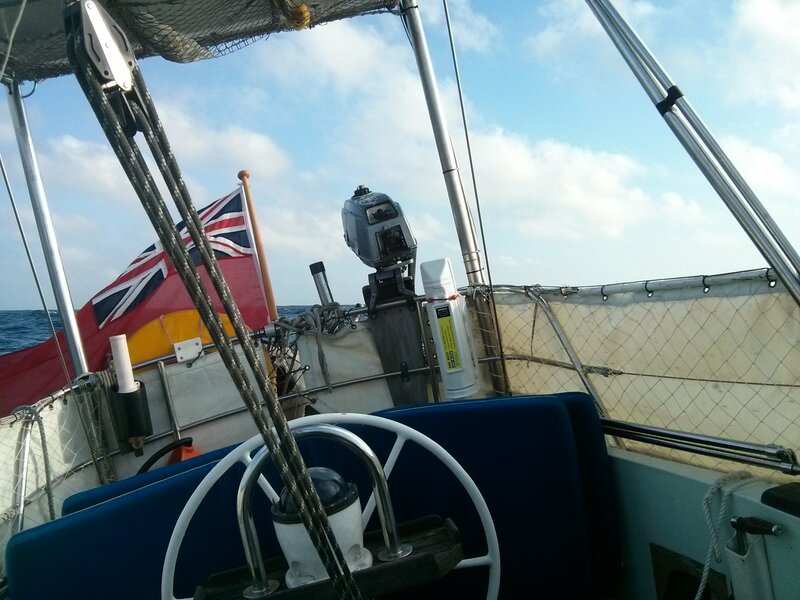 )… No matter, we’d be motoring at first anyway, and would have at least 3 night sails, so it didn’t matter so much. We had a rough passage plan, but this would be amended on the fly, and we would assess a more accurate arrival time into La Coruña when we were en route. We went to bed – our last UK sleep for a while – and I tried not to have dreams of storm force knockdowns. Previous Post6. So long, and thanks for all the fish….? Next Post8. The Bay of Biscay!